Sssh! You're in a Library! Vita: It's So Hot, It's On Fire! Earlier this week, Duke Libraries and the Information Science and Information Studies (ISIS) program invited harried students to come to one of the classrooms in the library and play video games. Rock Band, games on the Wii and who knows what else they were playing were far from the staid and sober associations most people have when they think of any library. It was loud. We had four projectors going simultaneously and they were put to good use. Unlike me, the students knew what they were doing. Before the start of the event, I tried using a Wii for the first time and was amazed at how much fun it was for a first time user. I last seriously played video games when my family's Atari 2600 was popular. I still tend to like the idea of shooting up two dimensional blocks of color rather than some of the super-realistic-violent games, but that's a rant for another evening. You can read a more thorough post about Game Night on the Library Hacks blog. Candles without covers have become increasingly popular at restaurants for some unknown reason. Last night, at Vita, one of my friends almost put the paper drink menu on one of the candles, but he noticed before it was too late. A few minutes later, I looked down and was forced to exclaim, "Oh my God, it's really on fire now." I quickly took my bread plate, turned it upside-down and covered the flames. Like many restaurants, they cover all of their tables with butcher paper, so it could have gotten even more interesting rather quickly. Another friend slipped the charred drink menu in one of the dinner menus, but I wouldn't have minded seeing our waitress's reaction. At Vin Rouge, where they have similar candles, I've seen many burned plastic menus, so I can't believe this doesn't happen to a lot of people. I ordered the ravioli of the day, which contained spinach and artichokes. Combined with their house spice mix and parmesan, it was quite good. The portion was smaller than their mammoth-sized personal pizzas, but it was still a great deal at $7. For dessert, I chose their sorbet and gelato trio. I picked chocolate and cherry gelato with a scoop of raspberry sorbet. From the pile of spoons, you can guess accurately that I had plenty of help with this one. The chocolate and raspberry were an excellent combination. Blu Seafood & Bar has half price raw oysters on Tuesday nights, which was good, because tonight I was in the mood for oysters. OK, when am I not in the mood for oysters? When it's time to eat dessert, of course. I had the Beau Soliel cool water oysters from Canada, for $13. I asked for extra lemons instead of sauce, because I always prefer lemon juice to any other sauce I've ever tried. They were excellent. I also had an order of fried oysters, which were wonderful. I've had these several times now and I can't get enough. They come with that delectable horseradish cream sauce and crisp parsley leaves. I finished the meal with their chocolate bread pudding with a coffee creme anglaise sauce. It was superb. The texture and flavor were perfect. It was a huge serving, too, but fortunately I had eager faithful readers with extra forks available. I've been busy the last couple of days. Back to our regularly scheduled program tomorrow. 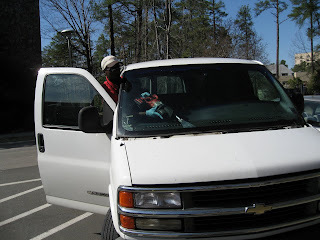 Some of you have been bugging me to get my cracked windshield on my van fixed for maybe five years or so. Two separate objects hit my windshield and the cracks have been slowly growing toward one another. It's actually slowed considerably since I started parking in my garage at night, though. In the past few months, KE4UVJ has been following me all around campus, shouting at me that I haven't gotten it fixed yet. He's even stopped by my office twice and that's only counting the times I was there. Loads of people have reminded me that glass companies often come out to wherever you are and fix it while you're at work. Well, I finally scheduled an appointment on-line. SafeLite, recommended by A Better Wrench, came out to my van yesterday and replaced it. Some people thought that the glass companies wouldn't even need my key to replace a windshield. Fortunately, that isn't correct. You can see Aaron, here,using an oscillating power chisel thingy, from the inside, in order to remove the old windshield. I say "fortunately" because otherwise there would be all these people impersonating glass companies and breaking into people's cars that way. My Second Most Faithful Reader took these great photos and he said that removing the old one looks as if it's a tremendous amount of work,because it's very difficult to remove the old gasket. 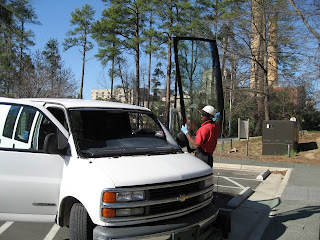 Here Aaron is puting on the suction cups so he can pick up the new windshield. 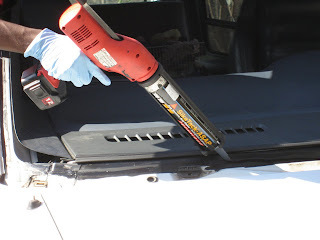 A powered caulking gun is used to heat and apply the new adhesive. 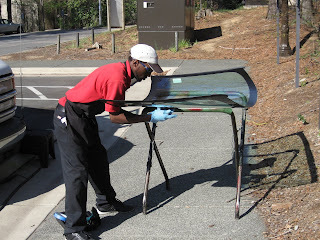 Once he put a bead of adhesive all the way around the edge, he had six minutes to put the new windshield in place. Isn't it beautiful? I'm very pleased with it. On Monday, all the area's gravel trucks will change their routes in order to match my commute. You can seen even more photos here. It seems very fitting that I went outside at lunchtime today and saw actual itty-bitty leaves on the oaks on the Academic Quad on West Campus. Hillsborough isn't nearly as far along as Durham, so at home the trees are still bare. We've been thinking a lot about water lately, even counting how many days of drinking water are left. Imagine not having potable water for five years. We suffer when we endure a week without electricity, perhaps due to a storm. Imagine five years of only having a few hours of power each day, if you're lucky. Some people are afraid to walk alone in some of our neighborhoods at night. Imagine five years of being afraid to even be outside your home during the day. Imagine knowing your country is responsible for all of this. That's the one thing we don't have to just imagine. Ms. Four tagged me, which is an honor and pretty exciting, because I've never been tagged before. Since I have a "random things about me" page, it was a little more challenging, but I may add some of these things there at some point. 1. I have a comet shaped birthmark on the side of my right foot. 2. One of my favorite things to do is stare at out the window and think. When I'm not thinking meditatively, I like looking for wildlife and noticing the images that are formed by the branches of the trees. I would like to think that my writing this will not hinder my getting a window office someday. I have self control. 3. I never throw away personal letters that people have written to me. I usually don't seem to answer them either. 4. I still have the popcorn bag from my first date. inconsistent that I wanted to spend hours answering the phone when I hate making phone calls, but it's really not. 6. I took one semester of Latin in high school. 7. I love toasted marshmallows. 8. I skipped the second grade. 9. I broke my skull at the Vasa Museum, in Sweden, due to being dropped on my head by my then ex-boyfriend. He's the one who went into shock. 10. I love playing cards, board games, chess and checkers, but I almost never do. I'm not extraordinarily good at any of them, but I just enjoy playing. Jan makes bacon and bakes bread. Need I say more? The Archer Pelican is on the move. Joe is always sharing pertinent information. Ginny should have lots of wacky facts to share. She hates bunnies after all. Durham Bull Pen likes oysters and takes great photos. I haven't been doing a lot of cooking at home lately and I can't eat out all the time, but I wanted to share with you one of my favorite lunches. I'm not a morning person, so I'm seldom ready to eat breakfast on the weekends. Cheerios is simply one of the best meals, particularly if it's late enough such that you don't want to spoil your appetite for dinner. Cheerios was probably the primary cereal that I grew up with, because I thankfully was not allowed to eat multi-colored sugar in the guise of breakfast pellets. I only needed to taste a sample of Lucky Charms that came in the mail one day to know that I was being raised properly. Some of you may have finally begun to understand my twinkieless existence by now. Ordinary Cheerios, of course, does not have sugar added. It is, therefore, very important to add it and add it correctly. You must have a spoon in your hand, ready for very moment that the milk comes in contact with your cereal. You must have the sugar, preferably an entire canister, waiting nearby. You pour the milk all over the cereal and quickly put it down, hopefully without knocking it over, but just ignore it if you do. Then you put one good spoonful of sugar over the cereal. The order is crucial here, because the sugar will stick to the cereal if it's wet and will just bounce off otherwise. The very second you finish applying the sugar, you must eat it as fast as you possibly can, because soggy cereal is gross. Don't even think about reading a book while you're eating. I devised this method of eating Cheerios when I was about four years old, I think, and I hope you like it. Drinking the sugar and milk mixture afterwards is optional, but certainly not something I would have done as a child. I wouldn't have had a cup of coffee with it either, but I'm sure I would have liked one. 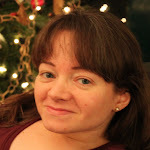 As my readers can guess from reading this blog, going to a restaurant for the first time is one of the most exciting things that I do, particularly if I have some reason to suspect that it will be good. Friday night, I went to Piedmont for the first time. Two of the owners are originally from Federal, so I didn't actually need the recommendations I'd gathered to know it would be great. It's a comparatively small restaurant and the tables are spaced fairly far apart, which makes conversation practical. They do have tables upstairs, so do request the lower floor when making reservations if that's a concern. We started out by sharing the cheese plate, which came with delicious nut-filled bread served with French le lingot, made with goat's milk and topped with honeycomb. It also had Spanish mahon, made from raw cow's milk and topped with dried cherries. The North Carolinian hickory grove cheese came with pecans. I believe the mahon was my favorite and had the sharpest flavor, but the le lingot was also awesome. I didn't taste this North Carolina striped bass that one of my friends was patient enough to let me photograph, but I got the impression that it was as good as it looks. The green beans and yukon gold puree with marsala jus looked particularly good to me. I had a hard time deciding what to order, because they had roast duck and an enticing entree of butternut squash risotto with apples, goat cheese and pecans. It would have been my second meal of goat cheese for the day and that was hard to pass up, but instead, I picked black pepper tagliatelle pasta with parsnips, roasted garlic, kale and parmesan. I think the parmesan was what sold it for me, but I also knew I liked all of the other ingredients. Kale is a wonderful leafy green vegetable if it isn't ruined with too much vinegar. Whole cloves of roasted garlic covered with parmesan are heavenly. It's always nice having a hard time deciding due to a plethora of fine choices rather than contemplating which undesirable side one can live with most easily. For dessert, I got one one of my friends to split two desserts with me, because I couldn't decide on that either. We shared the orange creme fraiche panna cotta with short bread cookies. It was a smooth and creamy custard with subtle orange flavor. I also wanted to try the granita, because I made it several months ago. I was delighted that it tasted exactly the same. Considering what a pain it was to make, I appreciated that this cup of frozen lemon goodness was worth every penny of $5 to get the coarse-icy texture. It also reminded me that I need to try making lemon sorbet soon. At the other end of the table, my Hippest Friend got the zabaglione with amaretti cookies. Our waitress brought out extra cookies, fresh and hot out of the oven. I have mixed feelings about almond flavoring and don't like marizpan, but the amaretti cookies were stunningly good. Thanks to HB, sister of the owner of Locopops, Summer Bicknell, I knew that the new Hillsborough branch of Locopops would have its grand opening today! I didn't, however, actually know where it was and started looking in the vicinity of the soon-to-be-open Weaver Street Market building. Fortunately, I just happened to run into the Archer Pelican, who had parked down there, and he told me where it was. It was great being able to catch up with him for a few minutes before heading to 121 Margaret Lane, which is roughly behind the new building. As you can see, it's in half of a quaint little duplex. You can also see the new parking building in the distance. They are working on a new parking lot that is to the right of the store when facing it. There was actually a ramp onto the porch before the construction started. For now, this branch of Locopops is not wheelchair accessible at all and anyone for whom that is a concern should take someone along to go fetch them. It's certainly worth the effort! For those of you who have never tried locopops, you must drop everything, go to one of the 4 1/2 locations and try one as soon as you possibly can. Until they switch to their summer hours, they are open from 12pm to 6pm. Locopops are Mexican popsicles, or paletas , and are either cream based or water based. Today I wanted to try locopops that I hadn't tried before, so I started out with a latte cream based one. It was just a wonderful creamy coffee popsicle. Some of the other creamy ones I could have chosen were Mexican chocolate, chocolate brownie, white chocolate peanut butter, cookies and cream, creamy lime and strawberries and cream. Here you can see my Second Most Faithful Reader polishing off a raspberry hibiscus water based popsicle, or paleta de aqua. Some of the other choices were mighty mojito, pomegranate tangerine, mango chile, mango raspberry, lychee lemongrass and hibiscus margarita. My 2nd MFR took this photo inside the store and of Connie Semans, co-owner of Locopops. I wanted to try the most unusual sounding water based popsicle, so I picked blueberry rosemary lemonade for my second course. As one would expect, the rosemary adds a unique flavor to a pleasantly tart and fruity popsicle. It was great! The night before I was born, my mom attended a Duke basketball game. One could literally say that I was born a Duke basketball fan. She also attended another game just a few days later, so one can infer how strong her loyalties were to the team at that point. As I got older, I became fairly obsessed with basketball this time of year, as most kids who grow up in this area do. I believed that an afternoon watching Duke lose to Carolina should also be accompanied by a Coke (with ice) and popcorn. Duke actually became really good at playing basketball. In 1986, of course, they went to the final game and lost to Louisville. I was completely traumatized. As I got older, when I was about 12, I reveled in the joys of arguing about basketball on local bbses. In those days, such arguments usually ended up with people's criticizing each other's grammar and I was always happy to jump in. Godwin's Law wasn't coined until 1990. Duke kept getting better and better. I think that this was actually when I first started losing interest, just the teeniest bit. It's a little more fun to watch when a win is impressive, rather than expected. The local rivalries eventually weren't quite as strong, for a while, particularly with NC State. The more college basketball, and college sports in general, seem like an entertainment industry rather than intercollegiate athletic competition, the more distasteful it seems to me. In the last few years, I've gradually lost interest in television all together. While part of it is because I think of watching television and sports as a social activity, the other part is that I'm not always convinced that spectator sports are beneficial in any way. Couldn't I be learning something instead? Filling out a petition? Speaking out against something wrong in the world? Writing about food? Wait a minute. Then I remember the importance of vegetating after a long day at work. The point of this unusually long-winded post is that, thanks to Twitter, I have renewed my basketball interest, at least partially. As I started following other people on Twitter, for some reason I ended up following primarily UNC fans. That was fun at first because it was neat getting reports of what was going on in various games and it was wild to see UNC fans complaining about all the same things that Duke fans complain about: the perception that the refs are officiating poorly and Billy Packer. As long as I've been following Wayne Sutton, from WNCN - NBC17, he's been advocating the use of Twitter #hashtags, which I wrote about here. For the last Duke vs. UNC game, he told Duke fans to include the #dukeunc tag and UNC fans to include #uncduke in their tweets. Those terms can then be tracked, either together or individually, so it's almost like being in a bar with a lot of like-minded fans, except you get to avoid being around rowdy drunk people! That's enough of a recommendation to get those who have never been sports fans into it, right? Tonight was the BlogTogether meetup for Durham Bloggers, which was combined with the meetup for the Science Communicatiors of North Carolina. Durham Blogger meetups are normally held at Tyler's on the second Tuesday of almost every month, at 6pm. It was fun talking with everyone. Abel Pharmboy's daughter was very patient with us, too. BrianR (not pictured), told us all about Carrboro Coworking, which will provide freelancers and others who are currently not satisfied with the isolation of working from home with a pleasant office environment. If I heard correctly, free coffee will even be included! When I'm not desperately in need of caffeine, I always get the fresh-squeezed lemonade at Tyler's, because it's just incredibly good and incredibly sour. I love it. I decided I really wanted to have some fish and chips, so I ordered that, even though it was catfish and I tend not to like catfish. It's just too greasy, but I'm always ordering things I don't like and don't seem to regret it as often as one would expect. I was pleasantly surprised to find that their catfish was nice and crispy and this was definitely the best meal that I've had at Tyler's so far. It was served very hot, so that helped. It came with a ton of garlicky fries, which were also great. This past Saturday, Gulf Rim Cafe, in Hillsborough, had an excellent special: black bean and goat cheese quesadillas. It's gotten to the point that I will order almost anything containing goat cheese, but I was very happy with the other ingredients, too. I could have used about twice as much guacamole, but that's because it was good guacamole. The leftovers warmed up nicely, too. They also brewed a fresh pot of coffee for me, which I sorely needed at the time. Sometimes I think I have a skewed idea of how much I've written about certain topics. For example, I thought I'd written quite a bit about my orchids and it turns out that in four years, I've only posted one photo. My orchids are almost like my pets, although they aren't exactly very cuddly, but neither are fish. I used to really like painting them, because the flowers would last so long, unlike irises or daylilies for which I'd have to finish in only a day or two. I only grow Phalaenopsis, because they are the easiest to rear. As long as they aren't being grown in some sort of newfangled gel I only have to water them once a week and I have orchid fertilizer mixed in with the water. Deviating from the schedule, however, results in a pile of blossoms in the floor. That's why I've had Remember the Milk sending me weekly reminders in several different ways for quite some time. One of my orchids has been blooming continuously for over two years. Every single one of my orchid plants is blooming right now. Still, I'm at my limit. I don't want to take care of any more. I'd rather not have to refill my watering can more than once per week. I don't want to get water stains on any more tables. So, when my Most Faithful Reader told me that she'd bought a new one for me my reaction was on the order of, "Oh..... Why.....? Where am I going to put it?" Then I saw that it was one funky looking orchid, indeed. I decided that having an orchid in the kitchen wasn't such a bad idea. ...but this is it! No more! Yesterday, I had the opportunity to drive around the pond at the Most Faithful Reader residence and was happy to see that that it actually looked as if it were an actual pond rather than a sad looking wading pool for the neighborhood dogs. My Most Faithful Reader took this photo from the passenger side door of my van. You can't normally see the Eno River nearly that well, if at all, from where we were. It actually looks similar to a river, rather than the grass-topped creek that it usually is around here. Fortunately, I didn't hear about any canoeists getting swept away in those rapids...this time. Earlier this week, I went to Taverna Nikos and relived one of my favorite dining experiences. Since 1992, I've ordered the Village Salad numerous times and on the new menu it's called the Nikos Salad. It's a wonderful combination of lettuce, tomatoes, potatoes, blocks of feta cheese, cucumbers, anchovies, whole olives and Taverna Nikos's addictive salad dressing. The Nikos Salad was almost exactly the same as it has been for years and I was very happy about that. When you order, they often ask if you really want the anchovies and they are easily removed if they don't. I removed them for years before I acquired a strong taste for them and I still avoid the olives. I met several of my co-workers for breakfast this morning at 7:30 am. I am not a morning person, so I believe it was one of the first times that I've ever had a meal that early, much less ventured out of the house at such an ungodly hour. We met at Rick's Diner and I'd never been there before, so it was easier to persuade me to experience morning than it would have been otherwise. To clarify, I once had lunch at the Rick's Diner location on Duke's campus, now deceased, but I don't think that counts. If you want a hearty breakfast on a weekday, don't want to deal with the crowds at the Cracker Barrell or have eschewed national chains, Rick's Diner is a good choice. The portions were huge, though, so unless you are starving or like wasting food, keep that in mind. I chose the "Make Your Own Omelette" with swiss cheese and ham, accompanied by hash browns and a biscuit. It was all good and the prices were reasonable, but again, it was way more than I could conceive of eating. They have good biscuits, so next time I go I'd like to try an egg and cheese biscuit. They serve breakfast until an 11:00 am. I'm counting on that. A small pool of water, especially rainwater. A small pool of a liquid. I apologize for not posting this earlier, but tomorrow night (Wednesday), at 8pm, the Duke Symphony Orchestra will be performing in Baldwin Auditorium, on Duke's East Campus. Again, this is an excellent opportunity for children to take their parents to a concert and teach them how to sit quietly and appreciatively during a performance of classical music. I went to ACME Food & Beverage Co. on Sunday night and those of you who have been following way too closely may remember that you've seen the lobster ravioli on this blog at least a couple of times. The first time I tried it was on New Year's Eve and the whole dish had a very strong grapefruit flavor, which was fantastic. Subsequent times (and there have been many) it had a light lemon butter or olive oil sauce and you could really taste the lobster, which was also great. This week, the ravioli was served with a thick chowder containing scallops and spinach. This incarnation was very filling and very good. I've also had the lemon pudding cake numerous times. This week, it was a lemon souffle cake. It was definitely different, but I'm not entirely sure how. Both lemon desserts were excelllent. WNCN - NBC17 is launching a new website featuring neighborhoods and communities across North Carolina, MyNC.com. To start off, they have a slick new beta site for Clayton, NC. The new site has local news stories and articles about attractions in the area. Visitors to the site are invited to submit photos, stories and will soon be able to upload video. The site even has an article about the Clayton Center, written by yours truly. We went to Blu Seafood & Bar on Saturday night for another wonderful meal. My Second Most Faithful Reader had this pork chop, which had a molasses-black pepper glaze and sweet potato ragout. He gave me a bite of the pork and it was quite good and juicy. My MFR had the fried oysters, which many of you have seen before. They have several new items on the menu, including jonah crab claws with lemon herb butter. They were delicious, but messy. They provided a nice damp cloth and lemon for cleaning up afterwards, which I, of course, forgot to use. There was a lot of meat in those claws and it was heavenly. I also had the yellowfin tuna tartare with sweet soy, avocado and miso vinaigrette. It came with a crispy-thin black sesame cracker and wakame, or seafood salad. I had a hard time deciding, when asked, whether I liked the crab legs or the tuna better, but in hindsight I'd say that this was my favorite of the evening. The combination of all the flavors together on pieces of the cracker was just amazing. I'm not even a huge fan of raw tuna compared to other raw fish, but at Blu I'm always willing to order contrary to my typical likes or dislikes and I haven't been disappointed yet. For dessert we shared a serving of their coconut flan, which is now on the menu. This was even better than when I tried it as a special. There was plenty of caramel sauce and that always makes me happy. I hope to go back soon, because I had a difficult time deciding what I wanted to try. The diver scallops with parmesan polenta Mediterranean relish was very tempting. Of course, I don't normally like polenta at all, so I'm sure I will enjoy it tremendously. I also think I need to try the chocolate bread pudding with coffee creme anglaise, don't you? Friday night, after dinner, I went back to Duke's West Campus for the Latin Chic party at the library. I took several pictures of the preparations as I was leaving work, because I thought that it would be way too crowded to take many pictures after the party started. I was right. They brought in 75 palm trees and an unknown number of fake ones. I particularly liked this color scheme. The party was very similar to last year's, except there may have been more students and fewer staff and faculty attending. There was certainly less food available, which was disappointing. My mouth still waters after reading last year's blog post. They did have very good creamy-raspberry tarts, of which I had three, but that's all that was noteworthy. I thought these lamps were certainly unusual, because they were filled with water and orchids. There was also a lot more dancing than last year and that was entertaining. I did get a little precariously close to it, though. The pavilion was also a highlight. I managed to peek in not long after I got there, but we deemed it to be too dangerous to return. The whole library was pretty much a mob scene, really. They actually installed furniture resembling canopy beds in the pavilion, supposedly for lounging. Fortunately, I think they were a little too unwieldy to drag off to the stacks.